ok im running 16"s on my 4th gen with 205/55's. i went to my buddy's house the other day and his dad told me i need to run run more pressure in them so they dont wear. he said low pros need to use more pressure than stock especially if they're wide. im running 35 psi now. am i good? Yea you're great man. You should actually run a bit lower, like 32psi so there is some cushion between the road and your rims. A good rule of thumb, is to check it when its cold and set them at about 5psi lower than the max load rating on the tire. Which is prolly 35-36psi. So you're golden. the recommended tire pressure is on the sidewall of every single tire ever produced. But If I'm correct, isn't that just the max PSI on the side of the tire, not the recommended daily driving PSI? no you can put alot more pressure in the tire (as long as there isn't any dry-rot), its just NOT recommended at all. if the tire is rated at 45psi and you put in 50psi, it won't necessarily explode on you then and there, but won't be a happy tire when you hit something. Umm...no. The sidewall pressure is not the recommended pressure...it is the maximum running pressure. You can pump up the tire beyond that (I ran my front tires as high as 50 psi for autocrossing), but risk a failure if you run it that way for an extended period. The recommended pressure is on a placard inside the door jamb. Unless you're running a radically different construction tire, it doesn't vary significantly with any tire you can fit under the wheel well. If anything, run a few psi high, but running more than a few pounds high will just wear the middle of the tire faster than the rest, just like running too low will wear the corners (and risk peeling the tire off the rim under high cornering loads). Know, too, that Prelude handling is sensitive to differences between front and back tire pressure -- a few psi difference has a noticeable effect. ya sorry i meant 205/50 a kid was trying to sell me 205/55's that day so i had the number in my head.. i know the manufacture recommendation is in the door, trunk, gas door, glove box depending on manufacture but thats also for the stock recommended tire size so i didnt know if i should run a little higher.. btw i def recommend tirerack.com thats where i got my front tires. sumitomo's fast shipping and the cheapest around!! 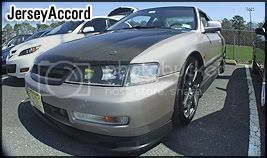 I have 225/50 Sumitomos (HTR200s) on my Prelude -- good tires. The reccomended tire pressure is in the door jamb, not on the tire. Don't go by anything the tire says other than the size, construction and speed rating info aka 205/45/R17 or whatever the case may be. The other stuff like max psi, dot rating, blah blah blah is just that. I'm really not kidding when I say this. Only measure tires cold. Tires are measured cold. Which means you drove less than one mile in the last three hours or have not driven in the last hour, whatever. Wait an hour before checking them or check em in the morning. Take the max tire load rating. Minus 5. Take that number, and shove it into your tire. Then your ballin. As long as your front/back tires are the same, put the same in all of them. Maybe one or two pounds more for the front end, as you got engine weight on em. Don't exceed the max load rating. And when you measure cold, don't put the max load amount into the tire. During the course of driving, your tires will usually gain about 5psi. Because they get hot. Hot air expands. Say tire max load is 40. You put in 40. Drive one hour and check. Tire psi is 45. Tires can explode, and its generally not recommended hat you put in more than the max rating when you're dealing with anything that concerns pressure. I worked in a welding fabrication shop that makes high pressure vessels for different industry. I'm talking vessels that held hundreds and thousands of psi. I've seen what happens when something goes wrong when something is under pressure. I have seen 12psi warp a 4 inch thick solid steel plate 20 feet across. I've seen a hydro test cover blow off and shoot a jet of water about 300 feet. For about ten minutes. psi is seriously underestimated. Besides, the wrong psi is not good for your tires. It can cause premature wear and bad gas mileage, as well as poor handling. Just take the max load rating, minus 5 or 6 psi, and pump your tires to that number, and you'll be golden.